Search and filter just like at Amazon or when booking a Hotel. Create your own classifications, without any need for customizing. Instantly download all data to Excel, modify it, and upload it again. Create a new thread or answer a comment in context of any Fact Sheet, mention another users easily. Receive notifications per E-Mail, e.g. if someone mentions you or if the quality seal is broken. Design a custom questionnaire and send it out to the responsibles of selected Fact Sheet. See all changes in the Inventory and get updates via RSS on all devices. Adjust every report, either by filtering or by applying different views. Use the export to embed reports into presentations or to create large printouts. Save reports either for your own usage or to share it with your colleagues. Create custom visualizations, with the flexibility of a drawing tool like Visio. Enhance LeanIX with own reports, which can display any data stored in the inventory. Would you like to see the features in a real use case? LeanIX is centered around the concept of so called Fact Sheets. Each Fact Sheet is driven by a specific concern in IT Management. E.g. to manage your applications you need relevant information about its usage by the business, the underlying technology, its interfaces etc. Therefore Fact Sheets have relations. 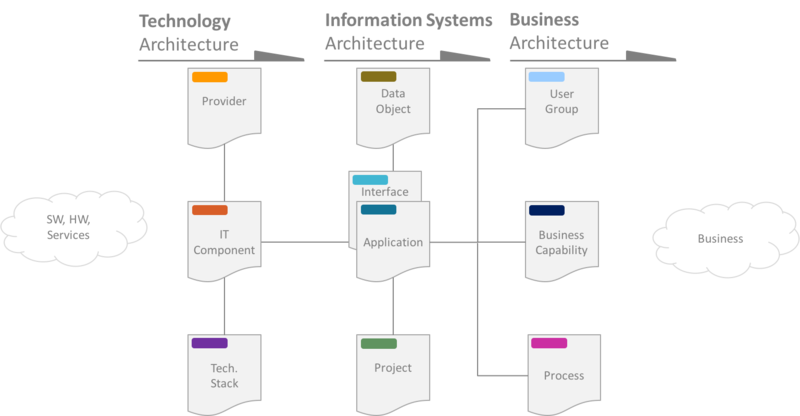 The following logical data model illustrates the main relations between the Fact Sheets.